I have been trying to find another set of books by Bergren that I enjoy as much as I enjoyed the Northern Lights Trilogy: Three Historical Romance Novels from Lisa T. Bergren: The Captain's Bride, Deep Harbor, Midnight Sun and the Full Circle series. Both those series are fond reading memories from my middle and high school years. They are not YA, but I would consider them staples of the Christian fiction genre. The Grand Tour series seems to be off to a somewhat promising start. I don't think it will live up to the Northern Lights Trilogy, but I do rank that one pretty high up there. 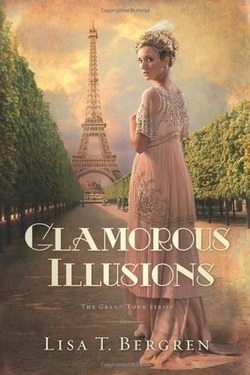 The premise of Glamorous Illusions centers around Cora Diehl who finds out that she is the illegitimate daughter of copper baron Mr. Kensington. Kensington takes Cora away from her birth mother and adopted father and places her among her half-siblings as they take the Grand Tour across Europe. Cora is then faced with social and cultural situations she had never dreamed she would deal with as she struggles to get to know her new family, her new social standing, and herself better. Structuring the book around the Grand Tour (which was, historically, a rite of passage for youth of privilege) is a pretty fun idea. You get the glamour of Europe and the dazzle of the upper class. I did find the way Mr. Kensington swooped in and plucked Cora out of her home and her entire way of living to be extremely jarring. It kind of seemed like Bergren needed a way to bring a gauche and somewhat naive girl into a group of social, aristocratic veterans. There was a little bit of anger on the part of Cora towards Mr. Kensington for pretty much ruining her life. But then she got over it. The (adoptive) father she's known her whole life is laying sick and possibly dying in a hospital bed and she "misses [her] Papa" and that's it? Kensington has an illegitimate child with a maid (Cora's mother) and then disposes of the evidence so as not to destroy his own marriage because of his mistake? Oh, but he sent Cora a piece of jewelry or two throughout the years so he's not a complete absentee father. Yeah, not really buying that. I felt as though there should have been more anger...more resentment...more angst...before Cora settled into her new life. Anyway, I do plan on picking up book number two. It's noNorthern Lights Trilogy, but it's not too bad. It has the potential to pick up steam as they chug across Europe...so let's see where this Grand Tour Train goes.